During the course of the year the Gr 10 learners have worked with many files which form a good set of notes. Mine will be collecting these files to learn from for the exams and for keeping for next year when they hand in their textbooks. Go over the OAO questions as they are good revision questions. Look at the question paper, answer sheet and how to solve, with the data files in a zipped file. Next on Gr 12 revision is Waiter evaluation on page 226 in the section Module 6.3: Practice makes perfect. Then decide if you are a digital native or immigrant! Recently I went dancing with a group at a local pub. I took photos with my cell phone. I was the oldest in the group but the only one able to upload the pictures to Facebook. Am I a native or immigrant? Grade 10 learners are doing their PAT about computer ethics which include hoaxes. Look at the article published today at http://www.timeslive.co.za/business/article690574.ece/419-scammer-to-be-sentenced-next-week A stupid person believed the hoax and lost a great deal of money. The hoaxer was caught by the National Prosecuting Authority. It is a very small world! Although I teach CAT I had the pleasure of attending the prize giving of the Computer Olympiad (IT) at Kelvin Grove in Newlands tonight. After the meal and the prizes were awarded, a mother of a winner approached me. She was Leneé Stapelberg from Nelspruit, also a CAT teacher who had done the GetSmarter Internet SuperUser course. Also at our table was CAT subject advisor Peter Davidson who had also done the GetSmarter Internet SuperUser course. We three had never met before but had communicated via the course forum and Twitter. Also present was one of my school’s IT boffins from long ago, Keegan Carruthers Smith, who now is coaching Olympiad contestants. Many of us were talking about the Office Applications Olympiad which will take place on Friday and hope it goes well. I am going to investigate computer ethics. I will focus on software piracy and the habits of learners in my class regarding the copying of music and computer software. From this investigation I will report to the LRC. I will indicate what the trend is and make suggestions to recommend some ideas to encourage good habits and create awareness of ethical behaviour. In order to produce a quality report I will apply quality control to find information and analyse this considering several relevant factors. I will use the Office package as a tool to achieve my objective. with the highlighted words changed, then comes the main question which is adapted to each learner's own topic. 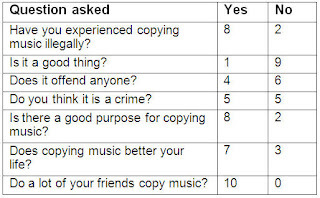 What is the trend regarding the copying of music and computer software among learners in my class and what might the implications be? The Uses of learners describes how the learners in the class misbehave or comply with ethical behaviour. This section is filled with graphs and comments to explain each graph. The Solutions section discusses IF so many did something, THEN this is a solution. They are busy with this section now and it is fascinating. 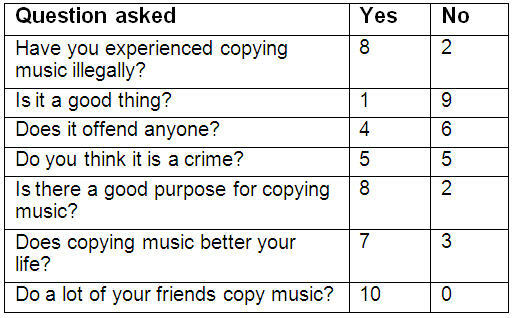 There are questions voiced such as IF copying music is bad, why do we have technology to copy music? IF spam clogs email boxes, thank goodness for ISPs and email programs such as Gmail which help block it. The Conclusion will bring the problem and solutions together. When we are finished I will go back and look at the rubric and make adjustments to the work. I have had experience with the PAT over a number of years and realise that I have spent too much time focused on the rubric and not enough on ‘teaching’. The rubric makes sense in standardising marking over provinces but it became the focus and not the task. My learners are becoming real infotectives. Holidays are a great time for attending conferences and playing with new software. I would appreciate it if this was tested for glitches and comments posted on the blog. User friendly? Quick download? Need special ...? Please? Thanks.